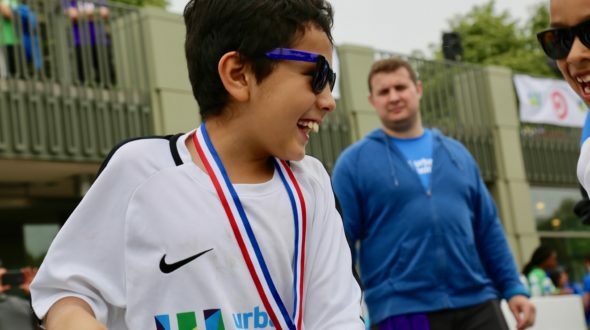 This year on June 2nd, Urban Initiatives celebrated our 6th Annual Work to Play Cup presented by Target. The Work to Play Cup is our opportunity to celebrate the hardwork and commitment shown by our continuum of programming participants throughout the year. These students step up to the plate every day in their classrooms, on the field, and in their communities. The Work to Play Cup brought over 37 sponsors together to support our students. With over 1,000 people in attendance, the event was incredibly successful. Students played soccer, recess games, participated in a dance party, and enjoyed lunch provided by Aramark. The entire Midway Plaisance was filled with smiles and cheers as our participants partook in the day’s festivities. The Work to Play Cup Hype Squad- tasked with keeping energy high throughout the long day- rose the the occasion and cheered on our kids with enthusiasm and positivity throughout the day. Target presented this year’s Work to Play Cup and showed up in numbers! 50 Target employees from Chicago stores volunteered at our Take the Lead station. They played handball, soccer, and capture the flag with our Team Captains. We concluded the day with an awards ceremony emceed by ABC7’s Dionne Miller. Every school received an award that celebrated their unique achievements and students received sunglasses and medals as prizes. In addition to our school awards, we also celebrated several community leaders. Union Pacific took home the Most Valuable Partner award for their longstanding commitment as a Champion Partner to Morton Elementary. We also honored the McGranahan Family for their incredible support over the last ten years. Thank you to everyone- from our sponsors, to volunteers, parents, coaches, and staff- who made the 6th Annual Work to Play Cup a success. This event means so much to our participants and allows us to show them how proud we are of all their work throughout the school year. We are already looking forward to next year’s Work to Play Cup!